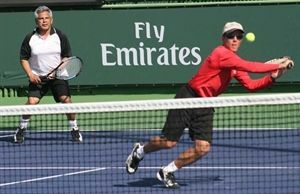 A combined USTA Southwest team of Phoenix-area women and Tucson-area men competed at the 2010 BNP Paribas Open Tri-Level Championships, March 19-21 at the Indian Wells Tennis Garden in Indian Wells, Calif. The tournament	is held in conjunction with the BNP Paribas Open professional event, and featured over 225 players from a variety of different USTA Sections. USTA Southwest's team placed fourth, a solid finish. The format for this team-based competition featured three different NTRP levels (3.5, 4.0 and 4.5) in each gender combining to form a USTA Southwest team. Teams advanced in their own NTRP draws, and accrued points for their USTA	Section based on their performance in each compass draw (3.5 Women, 3.5 Men, 4.0 Women, 4.0 Men, 4.5 Women and 4.5 Men). The format for the event was gender doubles matches in each level. The Phoenix women played spectacularly at this event, reaching the finals in the 3.5 division, winning the 4.0 division, and placing third in the 4.5 level. The Tucson men struggled a bit more, but still put up enough wins to keep the team in contention to the final day. USTA Southwest was 6-0 in three-set matches in both the men's and women's divisions, and showed heart and fortitude all weekend. But the ultimate winner was USTA Southern California, the champion of this event three of the last four years. Only USTA Southwest's champion team in 2009 has broken Southern California's reign of dominance at the BNP Paribas Open Tri-Level Championships. Players at the BNP Paribas Tr-Level event received complimentary tickets to the BNP Paribas Open Thursday-Sunday sessions of the second week, including finals tickets and got to play on the same courts the pros played on. A Player Party was also held on Saturday night to celebrate their attendance at the event. Tri-Level is growing in popularity across the country and across USTA Southwest, as more and more Districts are having true local Tri-Level leagues leading	feeding into Tri-Level Section Championships. USTA Southwest's Tri-Level event has been	held in January the last two years. Players can not be self-rated and must have computer rankings to play Tri-Level. For more information on Tri-Level or the BNP Paribas Open Tri-Level Championships, contact USTA Southwest League Coordinator Bill Lucero at leagues@southwest.usta.com or (480) 289-2351 x. 107.